Maruti Suzuki India launched its new Maruti Swift 2011 in India in August 2011 and since then it is selling like hot cakes. The new Maruti Swift is one of the most popular hatchbacks in India with the diesel variants even more popular because of its high performance and torque along with high real-world fuel mileage of close to 20 KMPL. But lately, a lot of users of new Maruti Swift started facing a very peculiar and serious problems related to the brakes. As per our previous report– New Maruti Swift Brakes Don’t Work at Low Speeds and Half-Clutch driving. This problem has been there because of low vacuum in brake boosters at low engine RPM which is caused by half-clutch driving. Previously, Maruti Suzuki has denied to accept that this was a problem with the car, rather it mentioned on its official FB page that it was the problem related to half-clutch driving habits and it recommended the owners to not drive in half-clutch in bumper to bumper traffic. But there was lot of dissatisfaction in many owners because of the same as one can not change their driving habits for a car. As per the latest update, new Maruti Swift brake problem has been solved – fixed by ECU software upgrade. Finally, after months of the problem being reported, Maruti Suzuki has finally come out with a solution. 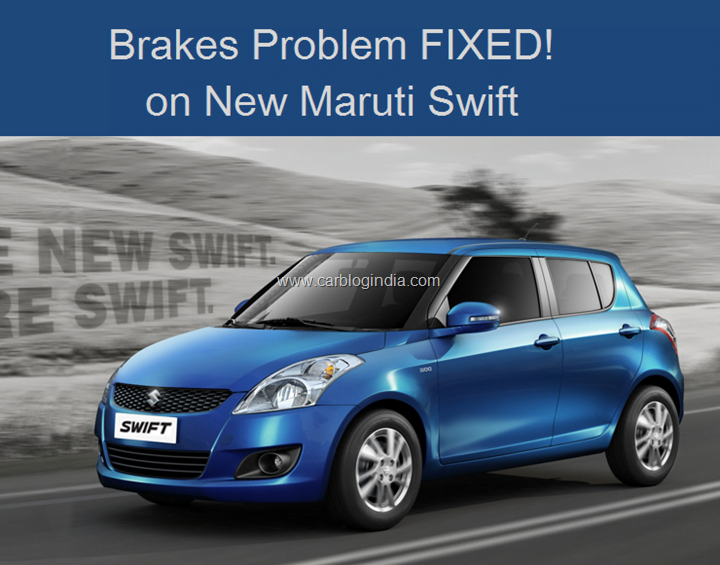 Although Maruti Suzuki has not officially announced anything on this to the media, but they car now contacting the new Swift customers who have complained about the brakes in the past. They are updating the software of ECU which is a computer which controls the engine of modern MPFI and CRDI cars. Maruti seems to have re-programmed the ECU to keep the engine RPM from falling below Idle levels and this ensures that there is always enough vacuum with the brake boosters to allow power brakes to be effective all the times, even at the half-clutch driving time in bumper-to-bumper traffic. These problems have been fixed on Maruti Swifts in Bangalore and Kerela and we expect that these corrections will be done to all the cars with problems across India. Interestingly, Maruti Suzuki is not officially recalling any cars in India. Since there is no mandatory recall procedures in India and there is only voluntary recall policy which gives manufacturers the choice to recall a car or not, there can be no legal binding for Maruti Suzuki to make a recall. Also since the ECU is being re-programed (as per the owners of fixed cars), it may require certification with ARAI again as this is a major change, so probably this is a reason why Maruti will avoid making an official recall on this. We will keep you posted on the details, stay tuned to Car Blog India.